Some the the Philippines’ most influential social media “thought leaders” — mostly from the current Opposition camp — are clucking about all the wrong things about three of the biggest issues confronting Filipinos today. Because of a lack of modern and intelligent thinking applied to their chatter, they contribute neither clarity nor value to the national “debate”. Rather, they simply add noise and muddle these issues further. Result: all the wrong argues win. It’s Strike Three and the Philippine Opposition is OUT. People quote the dissent’s lines with great emotional appeal, but the actual legal portions have no basis. The issue is Mr. Duterte’s sufficient — not perfect—factual basis. Passing is 50 percent, not 90 percent. Justices thus gauge the big picture, not single factual errors. Leonen goes far beyond facts to show Mr. Duterte interprets intelligence reports and the cultural context of Salafi-jihadis. He insists hundreds of armed men are terrorists and cannot possibly be rebels. There is something deeply wrong with Leonen. He has a megalomaniacal streak, I think. His rambling dissenting opinion at 92 pages is by far the longest among the opinions written by the 14 justices, longer even than the 82 pages of the decision itself, written by Justice Mariano del Castillo. Even back in 2016, the way Commission on Elections (COMELEC) Chairman Andres Bautista so quickly dismissed fraud allegations was already quite disturbing. You’d think the COMELEC chairman would, of all people, be the most curious if there is a pervasive and persistent challenge to the integrity of an election system he is directly responsible for. But rather than be curious over whether or not fraud actually happened under his watch, Bautista stood by his position (and continues to do so) that not even an investigation is warranted. Not surprisingly, this has only fanned more speculation that the COMELEC, the Liberal Party, and voting system vendor Smartmatic conspired to defraud the Filipino people. What is even more relevant in hindsight is the ultimate impact all this has on current “vice president” Leni Robredo today. Had an investigation been initiated by the COMELEC in those early days, Robredo today would have been spared the task of having to raise millions of pesos to contribute to the PET investigation now being driven by vice presidential candidate Bongbong Marcos. It can be said that the LP had shot itself in the foot. Robredo is now paying for the consequences of the LP blocking early calls to investigate fraud in the 2016 elections. And yet, no lessons had been learned seeing the sort of logic applied by Inquirer columnist Rina Jimenez-David in a column meant to dismiss the PET investigation. To David and the community of titas who paint Robredo as the “victim” coming out of all this, mere belief trumps the scientific method as a means to get to the truth. Convincing to pinheads, but not to people who are in the habit of thinking things through before reacting. Ever since Maria Ressa and her henchwomen at Rappler spinned an epic yarn about robot trolls and a “weaponised” Internet, the Philippine Opposition had rested on the notion that they too are “victims” — victims of a “fake news” industry bent on suppressing the “truth” as they, in their camp, see it. In short, the Philippine Opposition’s most prominent “thought leaders” believe: If we disagree with it, it is “fake news”. So desperate are they to make everyone believe in their own self-serving beliefs that they latched on to a list of “fake news” sites sent out by the Catholic Bishops Conference of the Philippines (CBCP) to validate their theses that the Internet is out to get them. What the Fake News Crybabies consistently fail to realise is that the Internet is a jungle and is taking power away from the Establishment. Specifically, the Establishments that once held a monopoly on information dissemination — big corporate mainstream media and the Roman Catholic Church — are crying wolf the loudest. Rather than compete in the new jungle, they would rather throw an epic tantrum and make up bogeymen like “fake news” sites and “troll armies” to make themselves come across as victims. Small wonder then that the current Philippine Opposition can’t seem to arrest its slide into irrelevance. Rather than step up to the challenge of uplifting the quality of their discourse they, instead, rely on scapegoats like “fake news” and fallacious appeals to emotion to prop up their hollow arguments. It does not help either that they lack a credible leader who could unite their different factions. Indeed, the very reason they remain fragmented is because of this lack of an intelligent position to unite around. As such, the leader the Opposition require needs to be intelligent. 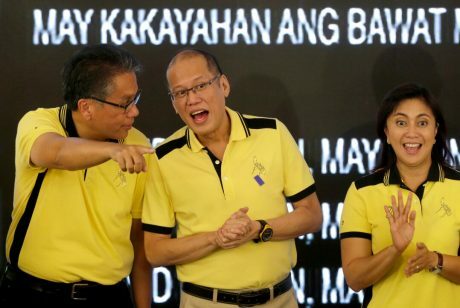 In that regard, things don’t look very promising for the Philippine Opposition at the moment. Next Article So what if Philippine President Rodrigo Duterte was “not invited” to the 2017 G20 Summit? they are the bullies to the pilipinos. what will happen to them? are they going to jail or just walk away for their crimes committed? By crying “fake news” and “bullying”, they cause their challengers to be in the defensive mode. So, if they can’t handle valid criticisms, they redirect the discourse and toss unnecessary issues in the space that should be occupied by more important ones. Can’t say there isn’t a method to their stupidity. Leonen is just a “running dog”of the Aquino Cojuangco political axis. To write a dissenting opinion on the Martial Law decision in Mindanao is the most stupid thing, I have ever heard. The Maute ISIS terrorists have taken over Marawi City, already. Soldiers died, civilians died; and this idiot thinks, this is not war ? Who would believe them, they could do better ?